The smooth shading which the color fade gradually and absorbed into the initial coat at the end, fine and flowing line or very delicate depiction of details. In order to achieve these seccessfully preparing a good canvas is essential. The canvas for thangka painting is called "Re-Shi" in Tibetan and usually 100% cotton cloth is used as support. In Nepal where there are many thangka painters, normal fabric shop knows what we want. I could just ask to shop "cotton cloth for thangka" and they would understand. But not here in Europe or Japan. "100% cotton white cloth" is just a category here. There are plenty of choice in this category. Each time I pass to fabric shop I ended up buying few different cotton cloths and now I have a big collection. 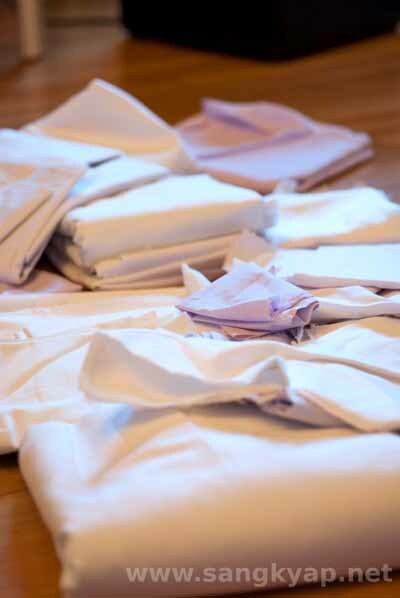 So the first thing I do to prepare "Re-shi" now is choosing a cloth from my collection. 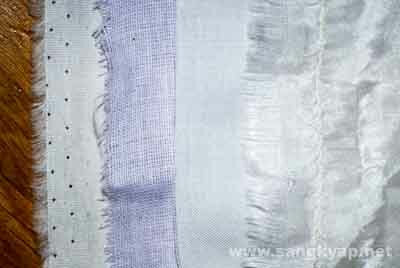 As you can see below there are big difference between each cloth. The one I was using in Nepal is the second one from right.